The sensor is a powered block that is able to detect the movement of players, objects, Asteroids, Ships, and other entities. It can be assigned actions to be triggered when something is detected, and after it leaves its radius. No Power There is no power being supplied to it, or it is switched off. 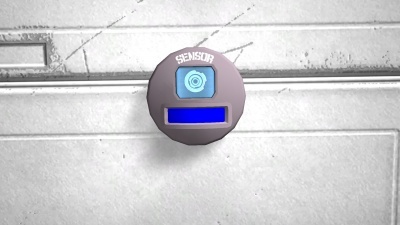 To visualize the sensor's range settings, you'll need to adjust your suit's HUD settings. When not interacting with any ship systems, press the 'K' key (default) to access your terminal. Go the 'Info' tab and select the checkbox which says "Show sensors field range". You will then also need to go to the sensor itself and interact with it with either the 'F' or 'K' keys (default) which will take you to the ship's control panel tab with the sensor selected. Below the sensor's name field, there's a "Show on HUD" option which must be switched to 'On'. Update 01.112 The sensor and Landing Gear seem to have issues with detection. If the sensor is set to detect small ships, and one locks into place near it, the sensor will trigger prematurely. This page was last modified on 12 May 2018, at 09:38.